Rimbaud mailing by Gregory Abbott, 1971. 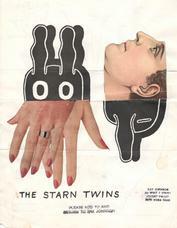 Anonymous “The Starn Twins” mailing, c. 1989. 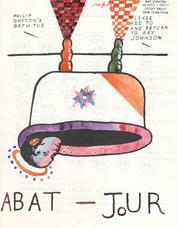 Anonymous “Phillip Guston’s Bat Tub” mailing, c. 1987-89. Now extended to October 2nd. In conjunction with “Please Add to and Return to,” a mail art activation presented by Performa in collaboration with the Ray Johnson Estate, Richard L. Feigen and Company presents Please Return To: Mail Art from the Ray Johnson Archive, an exhibition of never-before-exhibited related material. In collaboration with the Ray Johnson Estate, Performa has placed several of Johnson's mail art “templates” back into circulation. Please Return To will display original examples that were returned to Ray Johnson and are now in the Estate archive, among them responses to Johnson’s “Please Add Hair to Cher,” “The Starn Twins” and “Phillip Guston’s Bath Tub” templates, as well as a selection of collages that incorporate references to mail art practice. Also included are select materials from Johnson’s Rimbaud project, in which the artist printed a photocopied image of Arthur Rimbaud in the November 1971 issue of Arts Magazine with instructions to detach the page, alter it, and mail it to his home address. Within the Estate’s archive are nearly 100 responses to that prompt - in some cases with their original envelopes. The exhibition will open May 14 with an opening reception on June 3rd from 5:30 to 7:30pm.